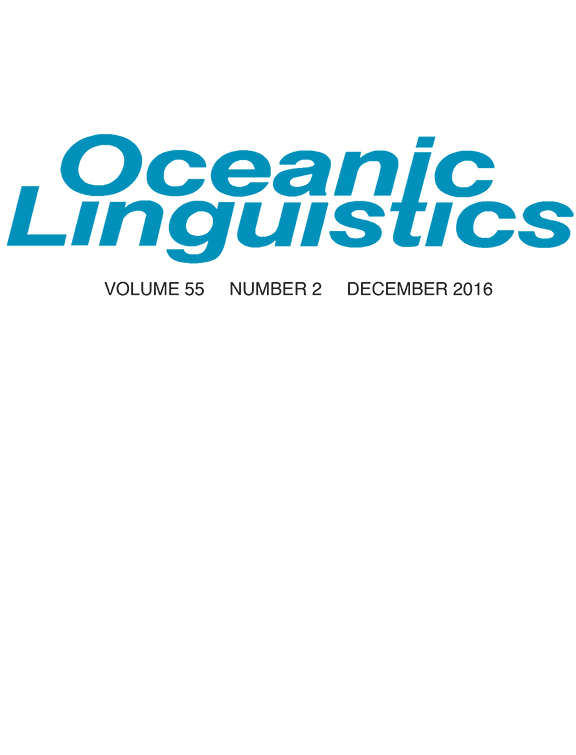 In 56 years, Oceanic Linguistics has been led by only three editors: George W. Grace, Byron Bender, and John Lynch. Below, Lynch shares the journal’s history, how he managed to complete Vol. 54 in the middle of a hurricane, and how the journal has kept up with its expanding field. John Lynch, editor of Oceanic Linguistics since 2007. Oceanic Linguistics will publish its 56th volume this year. Tell us about the history of the journal. Tell us about your journey to become editor of Oceanic Linguistics. I had been an associate editor of OL since 1999, but that just consisted of refereeing the occasional paper. A cabal consisting of the two previous editors, two other UH faculty associated with the journal, and a linguist then at UH Press suggested to me that, since Byron Bender wanted to retire as editor, perhaps the editorship should move south of the equator — and I was their suggested nominee. I guess the fact that I am originally from Australia, have a UH PhD, have lived in Papua New Guinea and Vanuatu since 1970, and was about to retire was qualification enough. George W. Grace (right) in Houaïlou, New Caledonia, in 1955. Source: Wikipedia. Grace founded the journal in 1962 and served as editor for 30 years. See Robert Blust’s “In Memoriam: George William Grace (1921-2015)” in Vol. 54, Issue 2. In your field, what issues are particularly relevant now? Two issues have remained relevant for many years. One is the historical interrelationships of the languages of the Pacific, both Austronesian and non-Austronesian, and the contribution of this study to wider Pacific prehistory. The other is the contribution that Pacific linguists can make to the general study of language and linguistic theory. How has Oceanic Linguistics evolved over the years? Do you foresee any changes on the horizon? The major evolution has been in terms of size: many of the early issue were 100 pages or smaller; the most recent issue, on the other hand, runs to almost 400 pages. The field has expanded enormously in the last half-century, and the pool of potential authors has expanded along with it. Byron Bender served as the second editor of OL for 15 years, and now serves as managing editor. Source: UH Dept. of Linguistics. Is there an issue that you’re particularly proud of? I’m especially proud of vol. 54, no. 1, of June, 2015. Final copy goes from my laptop to UH Press for printing. However, as I was about to prepare the final files, Cyclone Pam struck Vanuatu — the most powerful hurricane in Vanuatu’s history. We were without water for a few days and without power for two weeks. My son purchased a tiny gasoline generator, which kept lights and refrigerator going … and allowed OL 54(1) to be produced to deadline! Do you have any advice for those interested in submitting to Oceanic Linguistics? What are you looking for in future issues? Two things: 1) Find a topic that is interesting to other people, not just to you. And 2) write simply and clearly. This entry was posted in Oceanic Linguistics and tagged Editors, interviews. Bookmark the permalink.